Nelson was born in Abbott, Texas, on April 29, 1933, the son of Myrle Marie (née Greenhaw) and Ira Doyle Nelson. His birth was incorrectly recorded by Dr. F. D. Sims as April 30. He was named Willie by his cousin Mildred, who also chose Hugh as his middle name, in honor of her recently deceased younger brother. Nelson traces his genealogy to the American Revolutionary War, in which his ancestor John Nelson served as a major. His parents moved to Texas from Arkansas in 1929 to look for work. His grandfather, William, worked as a blacksmith, while his father worked as a mechanic. His mother left soon after he was born, and his father remarried and also moved away, leaving Nelson and his sister Bobbie to be raised by their grandparents, who taught singing back in Arkansas and started their grandchildren in music. Nelson's grandfather bought him a guitar when he was six, and taught him a few chords, and Nelson sang gospel songs in the local church alongside Bobbie. He wrote his first song at age seven, and when he was nine, he played guitar for local band Bohemian Polka. During the summer, the family picked cotton alongside other Abbott residents. Nelson disliked picking cotton, so he earned money by singing in dance halls, taverns, and honky tonks from age 13, which he continued through high school. His musical influences were Hank Williams, Bob Wills, Lefty Frizzell, Ray Price, Ernest Tubb, Hank Snow, Django Reinhardt, Frank Sinatra, and Louis Armstrong. Nelson attended Abbott High School, where he was a halfback on the football team, guard on the basketball team, and shortstop in baseball. He also raised pigs with the Future Farmers of America. While still at school, he sang and played guitar in The Texans, a band formed by his sister's husband, Bud Fletcher. The band played in honky tonks, and also had a Sunday morning spot at KHBR in Hillsboro, Texas. Meanwhile, Nelson had a short stint as a relief phone operator in Abbott, followed by a job as a tree trimmer for the local electric company, as well as a pawn shop employee. After leaving school in 1950, he joined the U.S. Air Force for eight to nine months. Upon his return in 1952, he married Martha Matthews, and from 1954 to 1956 studied agriculture at Baylor University, where he joined the Tau Kappa Epsilon fraternity, until dropping out to pursue a career in music. He worked as a nightclub bouncer, autohouse partsman, saddle maker, and tree trimmer again. He later joined Johnny Bush's band. Nelson moved with his family to Pleasanton, Texas, where he auditioned for a job as a DJ at KBOP. The owner of the station, Dr. Ben Parker, gave Nelson the job despite his lack of experience working on radio. 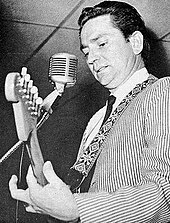 With the equipment of the station, Nelson made his first two recordings in 1955: "The Storm Has Just Begun" and "When I've Sung My Last Hillbilly Song". He recorded the tracks on used tapes, and sent the demos to the local label SARG Records, which rejected them. He then had stints working for KDNT in Denton, KCUL, and KCNC in Fort Worth, where he hosted The Western Express, taught Sunday school, and played in nightclubs. He then decided to move to San Diego but, when he was unable to find a job there, he hitchhiked to Portland, Oregon, where his mother lived. When nobody picked him up, he ended up sleeping in a ditch before hopping a freight train bound for Eugene. A truck driver drove him to a bus station and loaned him $10 for a ticket to reach Portland. In 2017, Nelson released God's Problem Child. The release, consisting mostly of Nelson originals co-written with Cannon, entered the Top country albums at number one, while it reached number ten on the Billboard 200. In 2018, Nelson sang a song written by Daniel Lanois called "Cruel, Cruel World" for the soundtrack of the Rockstar action-adventure video game Red Dead Redemption 2. The game features two versions of the song, with Nelson's version playing during the epilogue and Josh Homme's version playing over the end credits. Also in 2018, Nelson was one of several artists on Restoration, a cover album containing various country renditions of songs originally by Elton John, on which he performed "Border Song". Nelson's acting debut was in the 1979 film The Electric Horseman, followed by appearances in Honeysuckle Rose, Thief, and Barbarosa. He played the role of Red Loon in Coming Out of the Ice in 1982 and starred in Songwriter two years later. He portrayed the lead role in the 1986 film version of his album Red Headed Stranger. 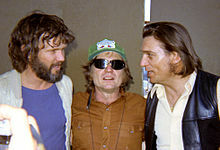 Other movies that Nelson acted in include Wag the Dog, Gone Fishin' (as Billy 'Catch' Pooler), the 1986 television movie Stagecoach (with Johnny Cash), Half Baked, Beerfest, The Dukes of Hazzard, Surfer, Dude and Swing Vote. He has also made guest appearances on Miami Vice (1986's "El Viejo" episode), Delta, Nash Bridges, The Simpsons, Monk, Adventures in Wonderland, Dr. Quinn, Medicine Woman, King of the Hill, The Colbert Report, Swing Vote and Space Ghost Coast to Coast. Nelson has been married four times and has seven children. His first marriage was to Martha Matthews from 1952 to 1962. The couple had three children: Lana, Susie, and Willie "Billy" Hugh, Jr. The latter killed himself in 1991. The marriage was marked by violence, with Matthews assaulting Nelson several times, including one incident when she sewed him up in bedsheets and beat him with a broomstick. Nelson's next marriage was to Shirley Collie in 1963. The couple divorced in 1971, after Collie found a bill from the maternity ward of a Houston hospital charged to Nelson and Connie Koepke for the birth of Paula Carlene Nelson. Nelson married Koepke the same year, and they had another daughter, Amy Lee Nelson. Following a divorce in 1988, he married his current wife, Annie D'Angelo, in 1991. They have two sons, Lukas Autry and Jacob Micah. Nelson owns "Luck, Texas", a ranch in Spicewood, and also lives in Maui, Hawaii with several celebrity neighbors. While swimming in Hawaii in 1981, Nelson's lung collapsed. He was taken to the Maui Memorial Hospital and his scheduled concerts were canceled. Nelson temporarily stopped smoking cigarettes each time his lungs became congested, and resumed when the congestion ended. He was then smoking between two and three packs per day. After suffering from pneumonia several times, he decided to quit either marijuana or tobacco. He chose to quit tobacco. In 2008, he started to smoke marijuana with a carbon-free system to avoid the effects of smoke. In 2004 Nelson underwent surgery for carpal tunnel syndrome, as he had damaged his wrists by continuously playing the guitar. On the recommendation of his doctor, he canceled his scheduled concerts and only wrote songs during his recovery. In 2012 he canceled a fund-raising appearance in the Denver area. He suffered from breathing problems due to high altitude and emphysema and was taken to a local hospital. His publicist Elaine Schock confirmed soon after that Nelson's health was good and that he was heading to his next scheduled concert in Dallas, Texas. After repeated instances of pneumonia and emphysema through the years, Nelson underwent stem-cell therapy in 2015 to improve the state of his lungs. In April 2010, Nelson received the "Feed the Peace" award from The Nobelity Project for his extensive work with Farm Aid and overall contributions to world peace. On June 23, 2010, he was inducted into the Library of Congress's National Recording Registry. Nelson is an honorary trustee of the Dayton International Peace Museum. 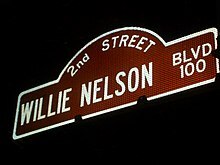 In 2010, Austin, Texas renamed Second Street to Willie Nelson Boulevard. The city also unveiled a life-size statue to honor him, placed at the entrance of Austin City Limits' new studio. The non-profit organization Capital Area Statues commissioned sculptor Clete Shields to execute the project. The statue was unveiled on April 20, 2012. The date selected by the city of Austin unintentionally coincided with the number 4/20, associated with cannabis culture. In spite of the coincidence and Nelson's advocacy for the legalization of marijuana, the ceremony was scheduled also for 4:20 pm. During the ceremony, Nelson performed the song "Roll Me Up and Smoke Me When I Die". The same year, Nelson was honored during the 46th Annual Country Music Association Awards as the first recipient of the Lifetime Achievement Award, which was also named after him. In 2013, he received an honorary doctorate from the Berklee College of Music. The following year, he was part of the inaugural class inducted into the Austin City Limits Hall of Fame. Also included among the first inductees was his friend Darrell Royal, whose jamming parties that Nelson participated in were the source of inspiration for the show. ^ Hartman, Gary, 2008 & [https://books.google.com/books?id=174&pg=PA174]. ^ Hartman, Gary, 2008 & [https://books.google.com/books?id=175&pg=PA175]. ^ "True Love - Linear CD Notes." Toots and the Maytals. tootsandthemaytals.net. Web. <http://www.tootsandthemaytals.net/linear-cd-notes/ Archived November 10, 2016, at Archive.today>. Retrieved 9 November 2016. ^ "Watch Willie Nelson And Merle Haggard in The Studio in All-New Footage". Texas Monthly. June 6, 2017. Retrieved February 4, 2018. ^ a b "The Performers in 'The American Epic Sessions'". WTTW Chicago Public Media - Television and Interactive. June 6, 2017. Retrieved February 4, 2018. ^ "'American Epic': Inside Jack White and Friends' New Roots-Music Doc". Rolling Stone. Retrieved February 4, 2018. ^ a b c Willie Nelson General Store staff 2010. ^ a b Hudak, Joseph (October 11, 2018). "Hear Willie Nelson's Studio Version of New Song 'Vote 'Em Out'". Rolling Stone. Wenner Media LLC. Retrieved October 11, 2018. ^ Taylor, David (September 14, 2018). "Willie Nelson upsets fans with plans to perform at Beto O'Rourke rally". The Guardian. Guardian News Media Limited. Retrieved October 11, 2018. ^ "Willie Nelson, Margo Price Lead 2017 Luck Reunion Lineup". Rolling Stone. Retrieved November 5, 2017. ^ Parker, Kolten. "Willie Nelson to rebuild central Texas ranch town after heavy damage from storm". San Antonio Express. Retrieved November 5, 2017. ^ "Willie Nelson Previews His New Record for Some Lucky Fans". Texas Monthly. April 17, 2019. Retrieved April 17, 2019. Dayton Peace Museum staff (2010). "Dayton International Peace Museum". Dayton International Peace Museum. Dayton International Peace Museum. Archived from the original on July 25, 2011. Retrieved May 15, 2015. Lewis, Randy (November 2, 2012). "Blake Shelton, Miranda Lambert and Eric Church win CMA Awards". Los Angeles Times. Tribune Media. Retrieved May 15, 2015.